As affable as he may seem, as much as you might think you could have a pint down the pub with him, Mr Nigel Farage has a dangerous and confused message for the nation. This week he called for laws to prevent racial discrimination at work to be scrapped. British businesses should be free to discriminate against immigrants, he said, and hire only British-born workers. Why? Because Mr Farage believes that too many immigrants are the cause of our problems. Then, another ‘cause’ of our problems, according to Mr Farage, is the ‘quality’ of migrants coming here. In particular, Mr Farage doesn’t like migrants, especially those from the former ‘Iron Curtain’ countries, who are willing to travel to Britain to do unskilled jobs such as picking our strawberries. They shouldn’t be allowed into the country, according to Mr Farage. The fact that we have millions of strawberries to pick, along with other seasonal farm work to be done, is beside the point. It’s British people who should aspire to pick British strawberries. (Never mind that almost half our young people go to university now and, actually, strive for higher-skilled, higher-paid employment – as do many of the migrant strawberry pickers. Do we really want to go back to the “halcyon” 1950s, when kids left school at 14 and most workers were unskilled and expected to hang-up their brains when they hung-up their hats? That’s hardly an option because soon there will be no unskilled jobs at all – robots will pick our strawberries and all workers of whatever nationality will have to greatly upskill to survive). It’s an old trick of politics to invent a non-existent problem so that you can propose a solution that expediently fits your ideology (i.e. prejudices). Mr Farage and his followers clearly don’t like immigrants. It seems to me that they yearn for a Britain of old, pre European Union: when the country’s ‘Single Market’ was our Empire and Commonwealth; when Britain was more white and more British; when we were a ‘super power’ that could tell other countries what to do; when diplomacy meant unilateral decisions and not ones made democratically with other European countries; when we were ‘of Europe but not with it’; when Britain could stand aloft from its continent that she had heroically ‘saved’ from two world wars (which ‘we won’); when Europe was ‘the continent’ full of ‘continentals’ who only had a roll and coffee for breakfast; when we were truly British, apart and above from all the rest, enjoying egg and bacon for breakfast, beef and Yorkshire pudding on Sundays, and fish and chips whenever we bloody well wanted. But we can’t go back to those days, and who in their right mind would want to? In 1961 Britain applied to join the European Economic Community (later to be called the European Union) precisely because our Empire was finished and our Commonwealth greatly diminished. Europe, not our ex Empire, now had to be our new ‘Single Market’ to enable Britain to survive and thrive. For sure, we couldn’t be the dictatorial head of this new ‘Single Market’, as we were with our old Empire and Commonwealth; but by working jointly and democratically with our European allies, we could share the leadership and benefits of the modern world’s most successful political, social and economic union of countries. Because that’s precisely what the European Union is: it’s the world’s biggest, richest economy. It’s the world’s biggest exporter of manufactured goods and services. It’s the world’s biggest importer of manufactured goods and services. It’s one of the world’s biggest democracies, with an elected Parliament whose sole mission and mandate is to protect the interests of the EU’s 500+ million citizens. And unlike the Nazi and Communist regimes that preceded it, membership of the EU is entirely voluntary, and requires all member states to adhere to its core founding principles of democratic governance; free and fair trade; human rights, and the ‘four freedoms’ of free movement across our continent of goods, capital, services and people. Is Mr Farage correct in his analysis that the quantity, quality and health of migrants coming to Britain are the cause of our problems? No. The opposite is true. The quantity, quality and health of migrants coming here, especially from the rest of Europe, are the cause of our prosperity, and the solution to what would otherwise be a problem of serious shortages of both skilled and unskilled workers. There are not too many migrants coming here from Europe. Why? Because the free movement of people to and from Europe is controlled in the same way as free movement of goods, services and capital: by ‘supply and demand’. Most EU migrants come here for jobs. If there are no jobs, those migrants either mostly don’t come, or they mostly go back home again. We currently have a relatively high number of EU migrants arriving because our economy is doing well, and there are a lot more vacancies here than most other EU countries. With fewer job vacancies, there’d be less migration. Our jobs market is the controller of free movement of people here from Europe. It’s as simple as that. The so-called ‘quality’ of EU migrants coming here is also not a problem, but a boon for businesses who need both skilled and unskilled workers to fill vacancies. Mr Farage may not want Bulgarian strawberry pickers here, but the fact is that our farms need those workers to do jobs that insufficient numbers of British people are available to do or want to do. As for the health of EU migrants, it simply isn’t true that migrants are arriving here ‘en masse’ to abuse our National Health Service. The opposite is true. Mr Farage may complain that ours is a National Health Service, and not an international one, but without migrant workers, our NHS couldn’t function. Around 30% of our doctors and 40% of our nurses were born overseas. Contrary to what people might believe from reading the Daily Mail or Daily Express, over 4,000 doctors, dentists and nurses from Romania work for our NHS. Rather than being sick or dying, migrants from other European countries are mostly young, fit and less likely to be ill or to have started a family. Subsequently, they make considerably lower use of our health service, costing a smaller amount proportionally to the NHS than Britons. As for migration here from outside of Europe, that can be and already is controlled by an Australian-style points system. But we don’t want a points-system to restrict movement across our own continent. Making it difficult to go from London to Lyon to find and take up work would be as daft and as damaging as restricting movement from London to Leeds. 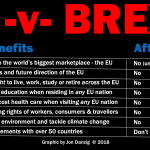 The EU has given all Britons joint European citizenship, with the right to live, work, study, retire or do business in any other EU/EEA country. Why does Nigel Farage seriously imagine that Britons, especially young Britons and future generations of Britons, would vote to give up their European citizenship? What politician is motivated to enter politics to take away peoples existing rights? Today, young people want to expand, not restrict, their horizons and opportunities. Mr Farage does rightly say that areas of the UK are suffering from a serious shortage of ‘infrastructure’ such as schools, hospitals and housing. 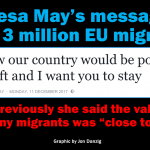 But he is wrong to blame migrants or migration for that. Again, the opposite is true. It’s migrants who are making a net contribution of billions to the UK Treasury that will help to pay for the new infrastructure that Britain desperately needs. 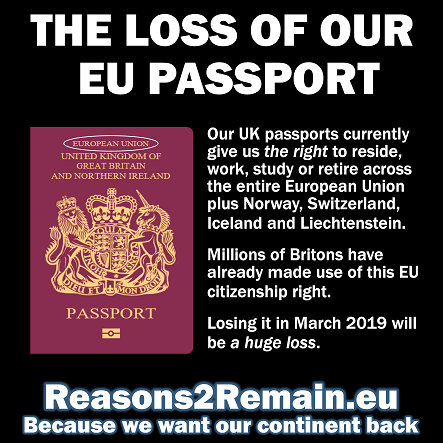 And even if no European migrants had come to the UK, and no British citizens had moved to the rest of Europe, we would still need a massive investment in new infrastructure. That’s because the numbers of Britons now living in the rest of Europe, and the number of citizens from the rest of Europe now living in Britain, just about match each other. Migrants are not the reason for poor infrastructure in Britain. So, Mr Farage, don’t try to kid British people into thinking that immigration is the cause of our problems, or that restricting EU migration is the solution. This entry was posted in Current Affairs, Democracy & Citizenship, Economics & Trade, Media & Communications, Politics & Public Policy, The EU and tagged discrimination, European Union, Nigel Farage, racism, unemployment. Bookmark the permalink.